Russia was the first country in Europe after Charlemagne’s medieval empire to set up the organized production of blades. Russian chronicles are heavy with references to swords. Russian Princes’ men-at-arms were buried with their trusty blades, and Prince Svyatoslav of Kiev famously cast his sword into the Dnieper River to deny it to the enemy. Slav swords were prized around the world. Arab scribes rated them alongside Frankish examples above any other type in Europe, and Eastern admirers even believed Russian swords to be “miraculous", possessed of magical powers. Russia was the first country in Europe after Charlemagne’s medieval empire to set up the organized production of blades. Bearing the individual blacksmith’s mark of quality, the Russian sword was typically around 40 inches (100 cm) long, its blade measuring 2-2.75 inches (5-7 cm) wide and 0.25 inches (6 mm) thick. The tip was not initially sharpened, since a heavy blow was enough to cleave the toughest armor. Swords were sold individually since not every soldier had the necessary skill or strength to wield the heavy blade effectively. Moreover, only the wealthiest people could afford these swords due to the complexity and cost of working with Damascus steel. For them, a fine example was worth as much as a war horse. Due to its higher carbon content and special forging process, a Damascus steel sword had a distinctive surface pattern and particular strength. It could hack through iron and would not break even if severely deformed. But since the steel did not react well to low temperatures it was unsuited to Russia’s climatic conditions. To solve the problem, Russian blacksmiths twisted together steel rods that were then hammered. Repeated ten times, the process yielded a Damascus steel sword with extra strength and flexibility. Long strips of iron were then welded to them to produce a blank blade to finish. Practically corrosion proof, these blades would go blunt but not break and would quickly resume their form if bent. A quality blade was judged by ear, a slight tap resonating long and clear. The sword was also expected to cleanly cut strips of thin fabric in mid-air. In one testimony to their strength and reputation, the Crimean Khan, a renowned connoisseur of weapons in the 15th century, also had a Muscovite prince send him a suit of armor made of Damascus steel. Producing quality swords was like the precision work of a jeweler. Iron and steel react at different temperatures, demanding incredible skill from the blacksmith. And although they worked with only a hammer and anvil in the 10th century, their swords were still superior to all others. 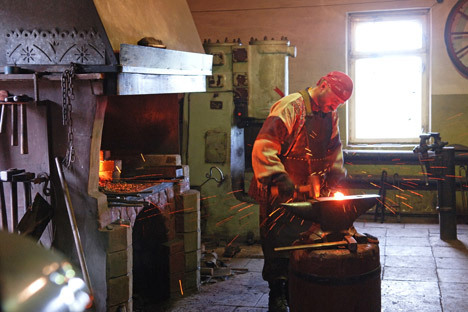 Centuries later, historians and scientists remained skeptical that Slav craftsmen had such refined metalworking skills in the early medieval era. In the late 19th century, a sword made of Damascus steel was found in an ancient burial mound in Kiev, and for more than 100 years was presumed to have originated in Scandinavia. But after cleaning, the blacksmith’s mark on the blade finally revealed that it had been made in Kiev by the blacksmith Lyudota. In time the Russian sword was transformed, becoming shorter and lighter and being increasingly used not only as a slashing but also a thrusting weapon. From the 15th century, the sword replaced the sabre before evolving into a heavier broadsword-type weapon for cavalry use. The Russian masters produced Damascus steel until the 17th century. The technique was preserved in a workshop on the Volga River that made swords for the early Romanov tsars. Finally, though, the invention of cartridge ammunition in the 20th century brought an end to the sword’s evolution. The secret of Damascus steel receded into the past, leaving behind only individual examples and the memory and legend of these unique blades. Some people even doubted that the technique had ever existed until it could be recreated in the late 20th century using computers and modern lathes. The time of the exquisite Russian sword has long since passed. But today the successors of the ancient blacksmiths still create magnificent examples of edged weapons at the arms factories of St. Petersburg, Zlatoust and Tula.